Young Cheesemaker Says Goodbye to Wisconsin - Hartke Is Online! My name is Bill Anderson. I am 25 years old. I was born and raised in Wisconsin, and have lived here for my entire life. Though I grew up in the suburbs of Milwaukee, I just completed the entire Wisconsin cheese maker licensing program, and passed the final exam yesterday. I should also mention that my mother grew up on a diversified family-run dairy farm in central Wisconsin. However, this week I am making the biggest move of my life. I am moving to Athens, Ohio, to start an artisanal cheese program for Snowville Creamery, in the foothills of the Appalachian Mountains. But before I leave my home state, I would like to share some of my thoughts and observations with this Board of Directors. As someone who greatly cherishes local sustainable agriculture, artisanal cheese, and the community of people who share those values, it was not an easy decision for me to leave Wisconsin and seek opportunities elsewhere. Today, America’s Dairyland stands at a crossroads. There is a clear choice before you: Agriculture or Agri-business? Shall we sacrifice the family dairy farm at the alter of profit and commerce? Or shall we nourish the types of culinary and agricultural traditions which make nations like France and Italy famous — and might I add, models for our Wisconsin cheese makers today? Conducting business is a reality in our modern market-driven economy. However, it would be a grave mistake for us to believe that the interests of business ought to trump human concerns such as environmental quality, health, social justice, and local democracy. Sadly, my experience in Wisconsin has led me to believe that this state is increasingly placing the values of commerce and industry over the interests of the people of the state, particularly in the realm of agriculture. This has been most dramatically illustrated recently, by the ongoing struggle over consumer access to farm-fresh raw milk. Despite overwhelming public support for the availability of this whole unprocessed raw milk, and budget shortfalls which have left this Department understaffed, the division of food safety and the dairy processing industry have only intensified their campaign to criminalize any dairy farmer who dare forgo the mandatory middleman, and connect directly with his or her consumer. However, raw milk is not the only issue which illustrates this trend. This state of Wisconsin has aggressively pursued premises registration, and attempted to prosecute Amish farmer Immanuel Miller for his religious objections to the National Animal Identification System. Fortunately, the judge in his case vindicated him in no uncertain terms, laying to waste the state’s rationale for the NAIS and premises registration. It would be behoove every member of this board to read the judge’s ruling in Immanuel Miller’s case. Another example of this troubling trend is the continued expansion of large CAFO dairies, their heavily subsidized manure digesters, and the Livestock Facility Siting Review Board which greatly limits the power of local communities to regulate these factory farms. My final example is rather personal. I was recently hassled by the division of food safety, over my cheesemaker license application, for citing the Wisconsin law pertaining to cheese maker and butter maker licenses — Wisconsin Statute 97.17. This section clearly states that it shall not apply to a person making up a product on the person’s farm. In fact, Anne Topham of Fantome Farm, who is widely considered to be the grand matriarch of the Wisconsin goat dairy industry, began her career in the 1980’s making farmstead goat cheese in a licensed dairy plant on her farm, but without a cheesemaker’s license. And she did this with the Department’s approval. Wisconsin would not have the goat dairy industry it does today if it had not been for Anne Topham. Though the relevant law has not changed since the 1980’s, the Department would no longer allow someone like Anne to do what she did, for fear of upsetting the Wisconsin Cheese Maker’s Association — which by the way, also lobbied heavily against the raw milk bill. It is never easy to confront entrenched moneyed interests, and there will always be struggle and conflict whenever one does. But it is absolutely essential that these commercial interests be confronted. If I come back to Wisconsin in 5 or 10 years, I hope to return to a state that cherishes and protects its local foods and family farmers. I would be greatly saddened to return to a state overrun with factory farms, in which the small diversified sustainable dairy farm has been driven to the brink of extinction by overzealous regulators and corporate interests. I wish you all the best. It is my hope that my comments today have generated more light than heat. Please make Wisconsin proud. Bill Anderson gave this speech, Wed. August 11th before the DATCP Board of Directors meeting, the day before he moved to Ohio, and the day after he passed his Wisconsin cheesemaker licensing exam. He is a talented young cheesemaker with a bright future. Congratulations, Bill on finding greener pastures! 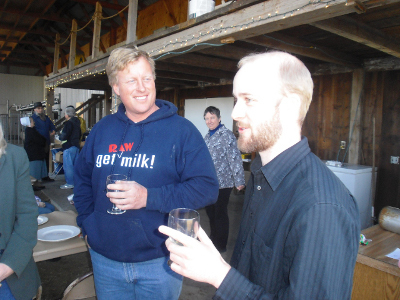 See Bill’s recent articles on Old World Cheese Traditions in Raw Milk Cheese on Hartke is Online! Glad he gave them his 2 cents. Unfortunately raw milk is illegal in Ohio too. Excited to have you here in Athens. Track me down when you arrive; I’ll show you around town. Jim, let me know its ok and I will give your email to Bill. I’m already here! I was just in town accompanying Warren Taylor when he spoke to a college class at the University. We just got back to the farm & creamery in Meigs County, where I’m writing this from. Do you live in Athens, or outside of it? I’d love to meet up with you when I have a chance. Is there a good way to get a hold of you? Great article from a Wisconsin friend I have gotten to know and respect. A trail blazer for real food the old fashioned way. Thanks Bill for all you have contributed to Wisconsin. It is a shame that you should have to move because of the idiocy of a few people who abuse their power. What a travesty. I’m not sure why Mr. Anderson thinks Ohio is going to be any better. We’ve had more than our share of raids local family operated farms and co-ops.